Annabella and Stanley are in the process of removing everything they own in their fabulous 40,000 square foot loft. They are a bit big on minimalism. Included in 2017 Member's Juried 2, Concord Art Center. 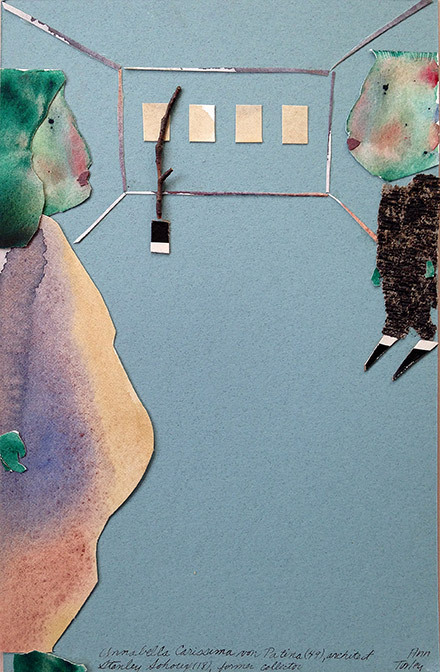 Construction paper, collage elements, and slight but very imaginative use of paint and unhealthy color create a delightfully inscrutable narrative within the confines of this small work. Cut lines create dramatic perspective that contains and constrains these figures in a claustrophobic scene. Snips of paper become the weirdest shoes/slippers; tiny green hands may be clutched in fists.